The World Cup, which starts this week, is the most-watched sporting event in the world, having reached more than 3 billion people in 2014. This year, Egypt, Morocco, Nigeria, Senegal, and Tunisia will be representing Africa. 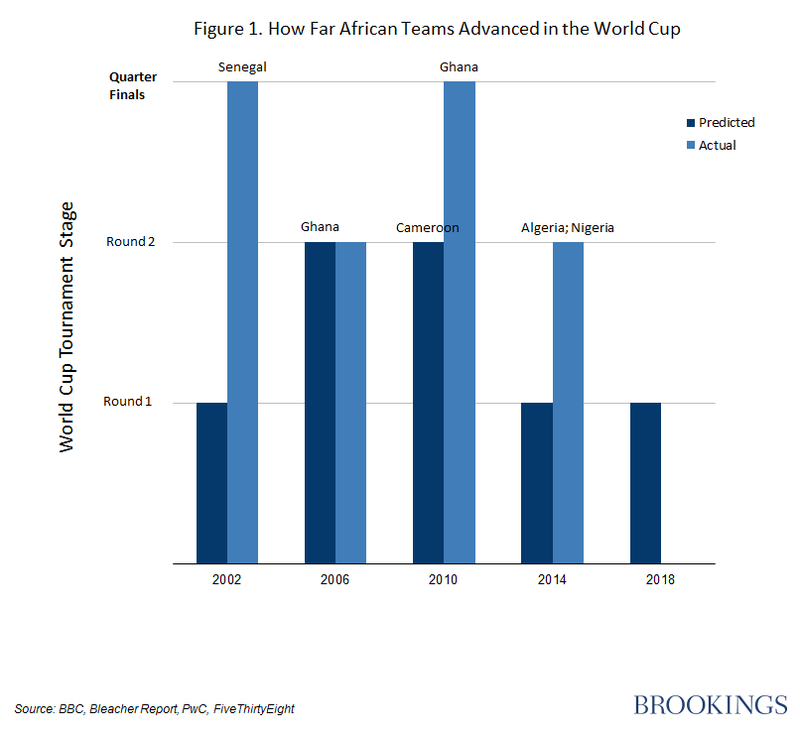 African teams in the World Cup are rarely predicted to advance beyond the second round, if that, despite outperforming expectations in three of the last four tournaments (Figure 1). Indeed, there are plenty of reasons to think African teams might defy the odds, but just playing in the tournament can provide a boost to national unity and social progress. Recent research on the connection between soccer and nation-building has found that between 2000 and 2015, countries that even just barely qualified for the African Cup of Nations experienced significantly less conflict in the following six months than countries that did not qualify. According to the authors, individuals seem to be less likely to identify with their ethnic group than with their country after the national team’s victorious path through the qualifiers. Drogba’s call for unity is widely recognized for helping make way for the eventual signing of a peace agreement between the government and rebel groups in early 2007. When fighting resumed in 2011, Drogba was nominated to the national Truth and Reconciliation Dialogue Commission, reflecting the role of the soccer star as a peace figure. This year, Egyptian star Mohamed Salah, the Liverpool striker, English Premier League’s Player of the Year, and African Footballer of the Year, has risen to international fame and led Egypt to its first World Cup qualification in nearly three decades. Salah has capitalized on this moment to push for social progress with a receptive public. For example, in addition to investing in clean water projects in rural Egypt, his appearance in a government anti-drug campaign led to a 400 percent increase in the number of calls to a drug rehabilitation hotline, according to government officials. In some African countries, qualifying for the World Cup can also strengthen a sense of pan-Africanism. Research on the political discourse within soccer coverage in newspapers suggests that, depending on national contexts, pride in qualifying for the World Cup can manifest itself as pride for Africa. The study compares discourse during times of World Cup qualification for Côte d’Ivoire and Ghana. While past discourse around the Ivorian World Cup qualifying team was over a notion of inclusive patriotism and “Ivorianess,” largely due internal ethnic conflict, according to the research, political discourse in Ghana around its national team “quickly merged with pan-Africanism,” and pride in the continent as a whole. A sense of unity around the continent would certainly be helpful during and indicative of a time of increasing continental engagement. In 2014, the African Union adopted the Common African Position on the Post-2015 Development Agenda—reaching consensus on common challenges, priorities, and aspirations—and is the only region to have such a unified statement. This March, the signing of the Continental Free Trade Agreement proved another notable step towards more continental engagement and integration, though the promise lies in its implementation. While there is something special about how soccer can bring people together, in the end, it is no substitute for sound policies and good governance. Representing Africa on one of the world’s biggest and most visible stages can help widen windows of opportunity for social progress and solidarity. The hope is that those opportunities are taken advantage of at each step along Africa’s promising path for sustainable and inclusive growth. Note: The highest prediction of the farthest stage to which an African team would advance. Predictions made by four leading outlets: BBC, Bleacher Report, PwC, and FiveThirtyEight. ← Why do people have such strong political opinions about economic issues? If we knew what works economically, why wouldn’t all people already support that?